Hundreds of Chinese vessels sailing close to the disputed Senkaku Islands in the East China Sea have reportedly been captured on camera by Japan’s Coast Guard. The aerial footage indicates the high level of tension in the area. The video, apparently shot from inside a low-flying patrol aircraft, has been released online by the Japanese Coast Guard, the Japan Times reported on Tuesday. 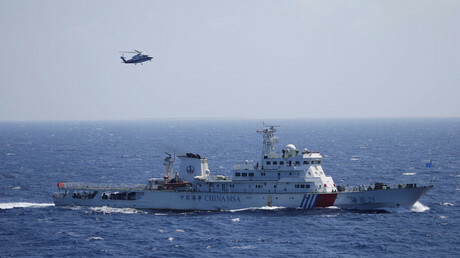 It shows what Japan said were multiple Chinese vessels traveling near the Senkaku Islands – known in China as the Diaoyu Islands – as well as Japanese patrol ships trying to prevent the Chinese ships from advancing into the disputed area. At the end of the video, the 1,500-ton Japanese patrol ship Aguni, armed with 20mm cannon, approaches a Chinese Coast Guard vessel and a fishing boat. The Aguni then flashes a warning: “Your ship has intruded into the territorial waters of our country … passage in Japanese waters is not allowed. Get out of this area immediately,” according to Japanese captions to the video cited by the newspaper. The Japanese Coast Guard later claimed that seven out of 18 Chinese patrol vessels spotted around the Senkakus were equipped with what “looked like machine guns,” according to the Japan Times. “Actions by the Chinese side like this, which will escalate the situation, are not tolerable,” the Japanese Coast Guard said in a statement. 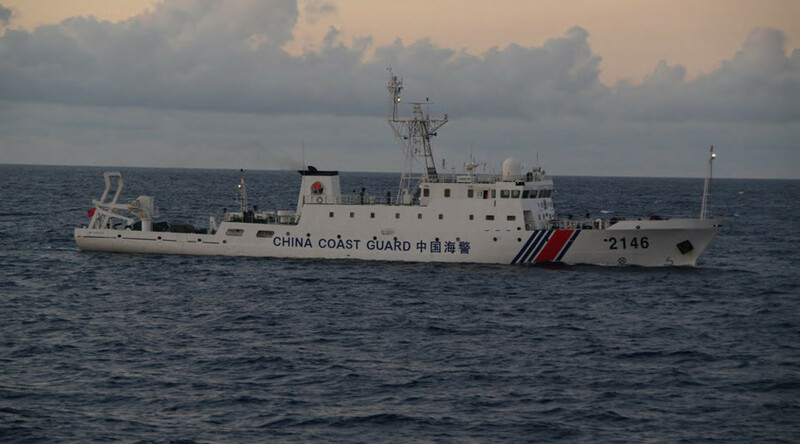 The apparently recent footage shows 200 to 300 Chinese fishing boats accompanied by 28 Chinese patrol ships spotted in areas just outside Japanese territorial waters around the Senkakus. The Senkaku Islands are administered by Japan but are claimed by China. The incident added fuel to tensions between Tokyo and Beijing. Last Tuesday, Japanese Deputy Foreign Minister Akitaka Saiki summoned Chinese Ambassador Cheng Yonghua to the ministry and filed a protest, according to the AP. But the heated dispute between Beijing and Tokyo over the national affiliation of the Senkaku/Diaoyu Islands dates back to 2012, when the Japanese government nationalized the islands' ownership. Beijing has never recognized the move, claiming Chinese authority over the islands. Chinese ships, mostly fishing boats, have frequently sailed in the disputed area since the islands came under Japanese-claimed authority.